Approximately 250 SIUE students, faculty and alumni laced up their shoes on Saturday morning and took part in the University’s inaugural SIUE Cougars Unleashed Homecoming Run. The event was co-hosted by the SIUE Alumni Association, Campus Recreation and the Campus Activities Board. The RiverBender.com highlighted the success of the event in an article posted Saturday, Oct. 1. 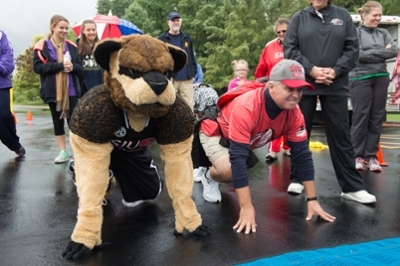 Photo: Eddie the Cougar and SIUE Chancellor Dr. Randy Pembrook take their mark at the SIUE Cougars Unleashed Homecoming Run.